Denticles on a United States silver dollar. Image Copyright: © 2016 James Bucki; All rights reserved. It is most commonly believed that these decorative designs were added to coins in order to help frame the subjects featured on the coins. It gives the illusion of a thicker rim while at the same time providing a decorative component to a utilitarian feature of a coin. The primary purpose of the rim on a coin is to help to protect the design elements from wearing away prematurely. A thicker rim would last longer and give better protection to the highest points on the design elements. A thicker rim would provide better protection to the design elements of the coin but it would be more difficult to strike. If you look at a comment United States coin you will see a raised flat surface around the entire circumference of the coin. If this was made thicker in order to provide additional protection, it may impact the artistic design of the coin. Additionally, it could cause problems in the striking process and the quality of coins would suffer. Most coinage produced in the 18th and 19th century had denticles around the rims of the coins. Keep in mind, that these coins were struck on the coining press that was operated by hand. A mint worker would have to use extreme force on a spindle attached to the top of the coining press in order to achieve enough pressure to impart the design on the planchet. Modern coining presses also use a collar to help form the coin during the striking process. In the early days of the mint, coining collars were not used and the metal was allowed to flow freely outward. This led to inconsistent diameters and edges that were rounded instead of square. It is thought that the addition of denticles around the rim would help restrict the metal flow so that the design elements in the deepest recesses of the coining die would fill in during the striking process. It is not known for certain if this really helped produce better quality coins. Currently, the United States Mint uses modern coining presses that can achieve tremendous pressure at a consistent rate. Therefore, the use of denticles around the rim of the coin is no longer mechanically necessary. However, you might see it return to a United States coins if an artist so chooses to use it. 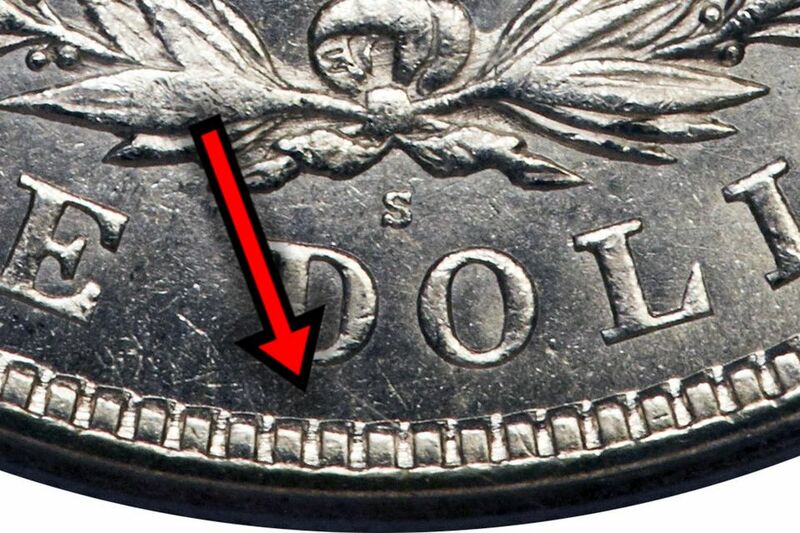 You should look closely in the denticles of Large Cents for misapplied mint marks. What is the Difference Between the Edge and the Rim of a Coin? What Is a Coin Planchet? Why do They Put Reeding on the Edge of a coin?